This looks like it is giving us everything a beta should; a taste of missions, the pvp modes (including darkzone pvpve), and endgame content. The first beta I played in the original game was phenomenal and had me playing nearly 13 hours straight. Hopefully this proves to be just as addictive and brings everything they learned from The Division to the table in The Division 2 Beta. Also, if you want to know more about what we are going to experience, make sure you read my Dark Zones & Conflict Trailer article. 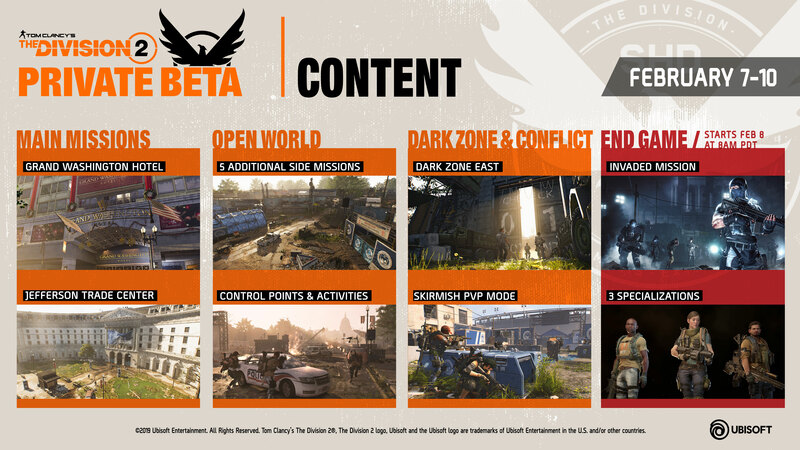 Today, Ubisoft® announced the content of Tom Clancy’s The Division® 2 Private Beta, including early game and endgame missions, running from February 7 at 1am PT through February 11 at 1am PT. 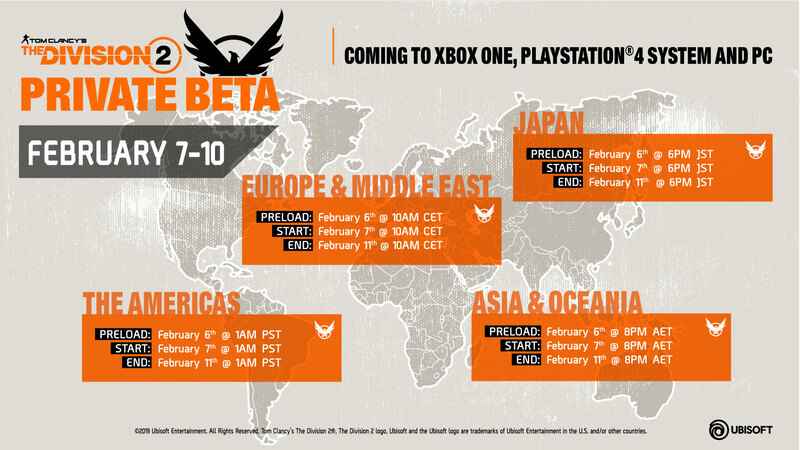 Private Beta preload begins on February 6 at 1am PT. 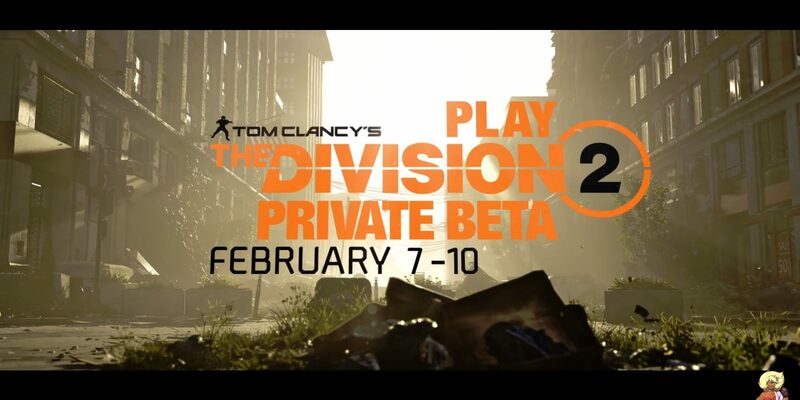 Xbox One, PS4, and PC players can secure their access to the Private Beta by pre-ordering The Division 2 at participating retailers. Already the fastest registering beta in Ubisoft history, players can register for beta access now for a chance to play at http://thedivisiongame.com/beta. In addition to this content, beginning February 8 at 8am PT, The Division 2 fans will have the opportunity to have a first hands-on with endgame content with one Invaded mission. Players will experience gameplay at the level cap of 30 and unlock brand new Survivalist, Sharpshooter or Demolitionist specializations. Led by Massive Entertainment in collaboration with seven other studios around the world**, Tom Clancy’s The Division 2 is the next evolution in the open-world online shooter RPG genre that the first game helped establish. Set seven months after a deadly virus was released in New York City, Tom Clancy’s The Division 2 will bring players into a fractured and collapsing Washington D.C. The world is on the brink, its people living through the biggest crisis ever faced in human history. As veteran Division agents, players are the last hope against the complete fall of society as enemy factions vie for control of the city. If Washington D.C. is lost, the entire nation falls. Building upon more than two years of listening to and learnings from The Division community, Tom Clancy’s The Division 2 will offer a substantial campaign that organically flows into a robust endgame, to create a cohesive and meaningful experience for all types of players. Is the XBox One Fated to Fail?